Would you like to view the following white paper in its entirety? Download the complimentary white paper to learn more about the qualities, tools, and technology that you need to demand from a card processing provider. 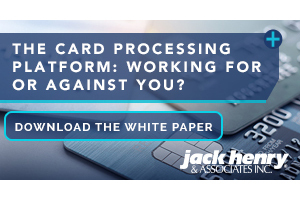 The Card Processing Platform: Working For or Against You? There are choices available regarding who processes your credit, debit, and ATM cards. However, many financial institutions do not always think through the potential consequences of this decision. Many do not even consider that they could make a change, or that a change might be well worth the effort. Starting with the most obvious pitfall, it’s important to look at the vendor’s customer service. Some institutions have accepted a vendor’s poor service level and just see it as an aggravating but normal cost of doing business. It isn’t. Inadequate customer service means inadequate cardholder service, which reduces usage, affects retention and acquisition, and reduces top-of-wallet opportunities. Another risk factor is settling with a processor that cannot offer the features, services, and technologies needed to satisfy cardholders. Are the reporting tools adequate? How well do the services integrate? The answers to these, and other questions, can help tell the story of whether a card processing provider is working for or against you. Let’s take a closer look at some specific features that make a big difference. Access to cardholder behavioral data is the key to making informed business decisions. A card processor needs to offer advanced analytic tools and streamlined reporting to help institutions understand the performance, profitability, and opportunities in credit, debit, and ATM portfolios. In an era of shrinking interchange income, you need a partner that will use data to help drive cardholder engagement, satisfaction, and retention, and will recommend and assist with portfolio optimization campaigns. According to a study published by The Nilson Report, the U.S. suffered approximately $8.45 billion in payment card fraud in 2016. It predicted that fraud will only increase in the following years. Obviously financial institutions want a card processor that has a track record of providing effective tools to mitigate fraud. A great card processor limits loss with minimal roadblocks in the way of a cardholder’s usage. It stays ahead of trends and keeps on top of day-to-day issues. In 2016, the financial services company, Kasasa, conducted a survey that found 83% of millennials would switch financial institutions for better rewards. A card processing vendor should offer loyalty programs that makes it easy to earn a meaningful award in as short a time as possible. That provides the positive feedback to keep this card at the top of a consumer’s wallet. Cardholders want a variety of redemption options and benefits, including merchant-funded awards, gift cards, cash rebate, an, including rebates for travel booked outside of the awards site. Smart institutions are always trying to move the needle on operating efficiency. Workflow management and automation are used to improve productivity and customer service. The level of integration between the core processor and card processor results in proportional productivity gains. The Durbin Amendment, as well as market forces driving more transactions to domestic debit networks rather than the global brands, have reduced interchange income. Institutions need to work harder to make card programs profitable. As mentioned above, your vendor ought to be on the front lines offering consultation. Financial institutions choose an in-house processing environment when they want complete control of their payment card accounts. They agree to handle statement processing, loan payments, transaction posting, and more on their own. Full service processing, on the other hand, outsources all of these functions, including back office support, marketing, security, and regulatory compliance. The point is that a changeover will be much smoother if you can stay with the same processor. If you are in a situation where a change might occur down the road, use a processor that offers both. Would you like to view this white paper in its entirety? Download the complimentary white paper to learn more about the qualities, tools, and technology that you need to demand from a card processing provider. What if you could find every service related to card processing under one roof, along with the best customer service in the industry? The JHA Card Processing Solutions™ (CPS) platform enables you to maximize revenue, increase cardholder acquisition, reduce expenses, mitigate risk, and expand wallet share. CPS offers full service and in-house transaction processing backed by a comprehensive suite of tools for fraud mitigation, digital payments, plastics manufacturing and personalization, loyalty programs, and data analytics. If you’re not meeting your cardholders’ constantly increasing expectations, chances are your cards are buried in the backs of their wallets. To learn more about how the CPS platform can help you maximize revenue, increase cardholder acquisition, reduce expenses, mitigate risk, and ultimately increase wallet share, let’s get in touch.